« Mururoa. More Proof that nuclear authorities lied for decades and still do. All is well at Fukushima Diiachi, apart from the things that aren’t. This what TEPCO would have the world believe. The whole thing has been a fog of conflicting information from the start. The fires in fuel pool 4 on 15 March 2011, though documented by the Japanese nuclear authorities, are denied by nuclear authorities active on the net. For instance. From late 2011 the nuclear authorities would have it that the reactors were in cold shut down, that the melt down was not an issue, though no authority knows the precise disposition, composition and temperature of the molten coria. Or it’s state of chemcial and radiological activity. The Japanese and US industries are talking about creating new technology to determine these things. Still, they say, all is well. 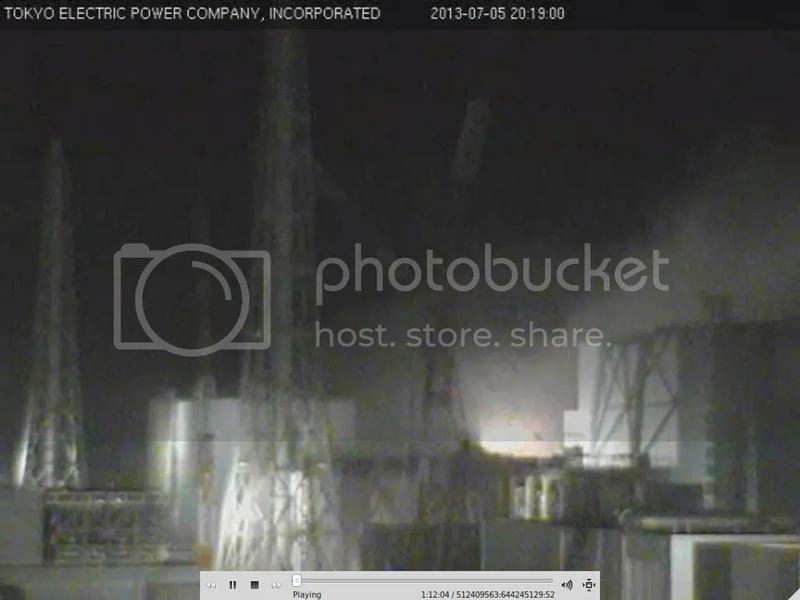 The pictures broadcast by the Tepco live cams have for 2 years told a different story, one which mutely presents a completely different story – one of a constant churning and emission of steam, smoke and particulates from the Fukushima site. Cold shutdown exists only because there are temperature sensors placed anywhere near the hot bits. The coria are not mentioned, out of sight, out of mind. The “sudden” admission of vast strontium, tritium and other radio chemical releases into the ground water – underground streams diverted by the Great Eastern Earthquake to a path which causes now the constant flooding of the reactor basesments – and the intense contamination of the Fukushima breakwater area and wider sea – has long been discussed by observers and downplayed by the industry. Majia Nadesan has been watching the Tepco live cams from the beginning is has recently collected some still photographs from that source. There is great concern that the plant remains unstable and remains threatened by the state of the coria as the molten pools continue to react with concrete, steel, water and soil. On her blog Majia writes: “I’ve viewed the TBS and Tepco webcams daily since they became available in the Spring of 2011. I have become very familiar with what is ‘ordinary’ on the cams and what is not. Higher radiation readings have been detected in many areas of Fukushima, adding more support for my contention that conditions at the plant are NOT stabilizing. For example, strontium levels are rising in ground water (for citations see here http://enenews.com/tv-groundwater-shows-massive-spike-in-radioactivity-levels-at-fukushima-plant-strontium-up-10000-over-past-few-months-video). The element composition may play a role in dictating the striation of the hot steam. Blackout events visible on the TBS cam seem to occur immediately after heavy steam emission events. Perhaps the blackout events on the TBS cam can be explained by the subsequent diffusion and settling of the striated bands of radioactive steam? Loss of heat would cause heavier radionuclides to fall unless they are swept up and out by the heat and coastal winds. There is a dichotomy between the reality presented by the industry and the actuality at the site. This divergence has been apparent since March 2011. It has not gone away, nothing is resolved. How much worse than admitted are the actual conditions at the plant, the Japanese nations and the world? Those closest in are always worse off, those far away remain trapped in the Post Fukushima distortions. All is not well. There is something rotten in the state of Japan – and the world. This entry was posted on July 5, 2013 at 11:49 pm and is filed under Uncategorized. You can follow any responses to this entry through the RSS 2.0 feed. Both comments and pings are currently closed.